Utmost mechanical stability is a prerequisite for perfect LP reproduction. In order to achieve it, all parts have to bemadewith extremely tight tolerances. In order to rotate the »LaGrange's« platter, weighing in at 16 kilograms, securely and without radial run out, the bearing has to have extremely tight clearance and absolutely minimal play. But with tolerances that tight, the different coefficients of expansion of the materials used begin to come into play. We therefore heat the bearing electronically in order to render it insensitive to temperature changes. The platter measures 9 cm in height and is slightly tapered towards the bottom. It is composed of a resonance-free alloy containing aluminum, copper, magnesium and several other materials. The LP is pressed onto the crystal glass platter top by means of a screw-down clamp. This intimate contact leads any tracking related vibrations quickly and directly into the platter. 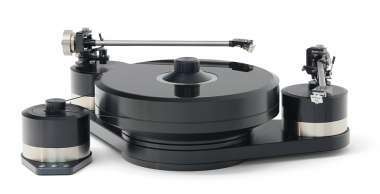 We offer the »LaGrange« turntable in versions for one or two tonearms up to 12 inches length. The arm bases are securely fixed to the base plate by means of adjustable collars. Adjustment of the tonearm is easily – and precisely – done by simply loosening a small set screw and rotating the arm base. The platter is driven via a precisionground round belt. Two speeds (33 1/3 and 45 rpm) are individually adjustable and selectable by buttons. The power supply for the drive and heating of the bearing is built with solid-state elements. The sound quality can further be optimized by using the optional »RöNt« power supply with vacuum tube technology for the drive whilst keeping the solid-state power supply for the bearing heater. Customers and the audio press alike are truly thrilled by the performance of the »LaGrange«, claiming it plays music with a hitherto unheard-of transparency. Platter weight 16 kg, Ø 316 mm, height 90 mm.